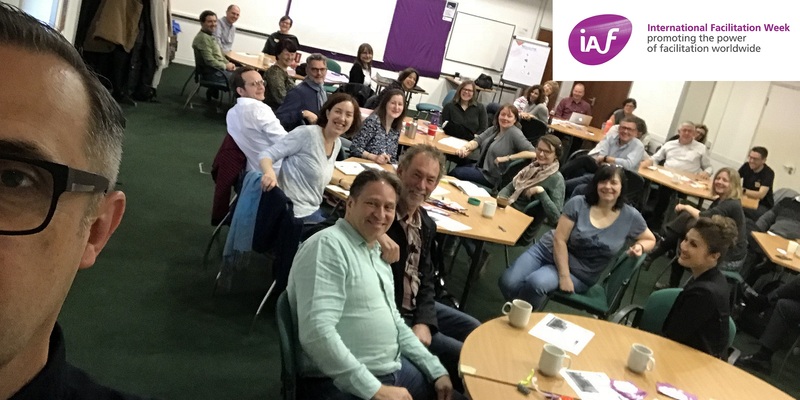 Join us to celebrate and promote the power of facilitation, and to connect, network and learn with other IAF facilitators & friends from across England & Wales and beyond! For International Facilitation Week 2019 we extend to our annual all-day all England & Wales networking & learning meetup to two full days of annual conference on the theme "The Power and Practice of Facilitation". You can expect a diverse range of highly interactive, peer-led parallel sessions to choose from - common to previous years' annual all-day meetups, and our regular afternoon networking & learning meetups #IAFMeetuparound the country. Pinar Akkaya of Signature Communication on "Swimming in unknown waters: facilitating in multicultural environments"
Martin Gilbraith on "How engaging can a virtual meeting be?" Pilar Orti of Virtual Not Distant on "Patterns of Preference: Designing a team charter that works for your team"
Dr. Penny Pullan CPF, author of Virtual Leadership, on "Practical strategies for getting the best of out virtual work and virtual teams"
Andi Roberts CPF on "Perspectives on Visual Facilitation: how to raise your visual competence"
Bill Staples CPF of IAF Canada on the "Journey from Facilitator to Facilitative Leader"
Simon Wilson CPF, contributing author to the IAF Handbook Creating a Culture of Collaboration on "Why collaboration goes wrong, and what to do about it"
a prize raffle on Saturday afternoon including free facilitation kit from Pinpoint Facilitation, a free Insights Profile from Steve Lloyd CPF and Lumina Spark Personality Portrait from Gary Austin CPF, free copies of Change Management for Sustainable Development from Penny Walker CPF and Leader Language LLQi from Neil Fogarty, free ToP facilitation training from Martin Gilbraith CPF, and more! Details of this year's programme will be included here as it is confirmed over the summer. To share any questions, offers, suggestions or requests for the programme, including speakers, sessions or raffle prizes, please add a comment to the Annual Conference event page on one of our regional meetup groups - London & SE, South West, Midlands & East, North of England & Wales. Register now on Eventbrite for both days, or just for Friday or Saturday. Our low, break-even registration fees include lunches and morning & afternoon refreshments but not evening meals or accommodation. Discounts are available for early registrations until 30 June, and an additional 25% off all rates is available to IAF members - please ask for the promotional code if you have not received it. If you are not yet an IAF member and would like to join, you can save a whopping 25% on your first year's membership if you buy it when you register for both days. Learn more about IAF membership. The purpose of International Facilitation Week #FacWeek is to showcase the power of facilitation to both new and existing audiences and to create a sense of community among facilitators and their groups worldwide. International Facilitation Week is 7-13 October in 2019 - however we have scheduled our annual #FacWeek event in the 3rd week of October as usual.